Compared with the preliminary estimates of Balance of Payments (BOP) which werereleased on the October 28, 2016, the revised estimates show that current accountdeficit has increased by US$ 57.5 million reached surplus of US$176.4, whereas capital and financial account surplus has decreased by US$ 7.4 million reached surplus of US$177.9 million. As a result, errors and omission have decreased by US$ 64.9 million. These changes are subject to quarterly survey received from enterprises. Particularly, the decrease is caused by the enterprises’ trade credits as well as foreign bank accounts changes. 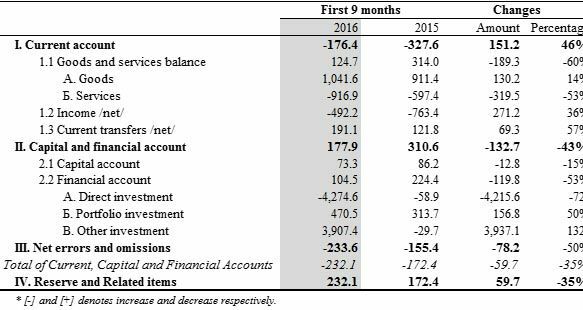 Current account deficit stands at US$ 176.4 million, decrease of US$ 151.2 million or 46percent compared to the same period of the previous year. The change is attributable to improvement in income account deficit by 36 percent with or US$ 271.2 millionwhich is caused by increase of re-investment income and decrease of dividend and interest payment from previous year. Whereas goods and services account surplus has decreased by 60 percent or US$ 189.3 million which is explained by increase of the major enterprises’ payment to the foreign financial consultancy and technical assistance services compared to the same period of the previous year. Capital and financial accounts showed surplus of US$ 177.9 million, decrease of US$132.7 million or 43 percent from the previous year.